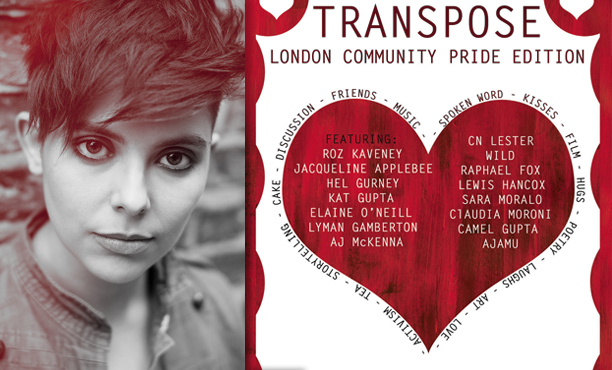 CN Lester writes about the London Community Pride edition of Transpose, an evening of music, art and the spoken word. I organised my first Transpose night in 2011. I think it’s fair to say that it was born out of frustration as much as anything else. I was tired of smacking my head against a wall when it came to transphobia and ignorance in the music industry at a time when I was saving up to record my first album, Ashes. A close friend of mine was being treated very badly by the NHS – again because of transphobia – and was being forced to buy his own mobility equipment. It made sense to organise a joint fundraiser. So I got together a bunch of trans and trans-allied artists I knew – Sally Outen, Naith Payton, Dr. Carmilla and The Mechanisms – and made a night of it, complete with an auction and a bake-sale. Since then we’ve raised funds for Mermaids, PACE and for Roz Kaveney’s American tour. Other artists have included Roz, Hel Gurney, My Genderation, Lyman Gamberton, Jesse Kailen, Elaine O’Neill, Wild, The Devotion Project, Jason Barker and Angelica Riotstar. The idea behind each night is that it isn’t about policing identity – the first rule of Transpose is “don’t make assumptions” – it’s about creating a welcoming space for anyone who’d like to support trans rights and enjoy some fabulous art – and, usually, eat some cake while we’re at it. The evening will be in three parts – first, storytelling (Roz Kaveney, Jacqueline Applebee and Hel Gurney) and a showcase from the My Genderation documentary project led by Raphael Fox and Lewis Hancox. Fox and Lewis began their film project at the start of 2013, and previewed their first short films at February’s Transpose. It will continue with art and discussion/Q&A (Sara Moralo, Claudia Moroni, Camel Gupta) – followed by poetry and prose (Kat Gupta, Elaine O’Neill, Lyman Gamberton). Finally, music from Wild and CN Lester to round off the night, and get the audience joining in. There will be other opportunities for the audience to participate on the night, including the Translations project curated by Camel Gupta and Ajamu, gathering portraits to show the variety, beauty and importance of the lives of Trans, Gender Variant and Intersex People of Color in the UK. Translations are hosting a video booth for contributors on the night. Plus there will be plenty of breaks to meet and mingle in between sets, and enjoy drinks and cake. The Pride edition is in aid of You Are Loved, a new trans youth suicide prevention initiative co-ordinated by Trans Bare All. 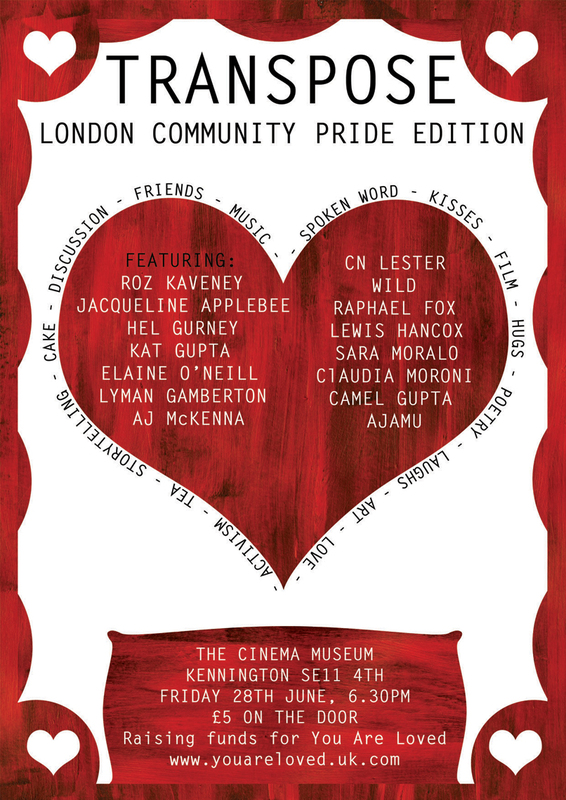 Transpose: London Community Pride Edition – an evening of art, poetry, film and music – will take place on Friday 28th June, 6.30pm at the Cinema Museum in Kennington. £5 on the door. Part of the Pride Arts Programme.